Console applications and batch files are regularly run at Windows startup or in a schedule. The main inconvenience of this is that each application opens a console window that flickers on the screen. 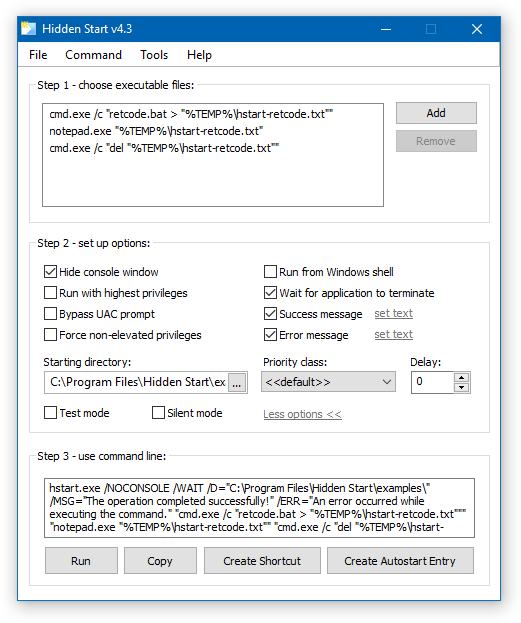 Hidden Start (or Hstart) is a lightweight command line utility that allows you to run console applications and batch files without any window in the background, handle UAC privilege elevation under Windows 10 and prior, start multiple commands in parallel or synchronously, and much more. 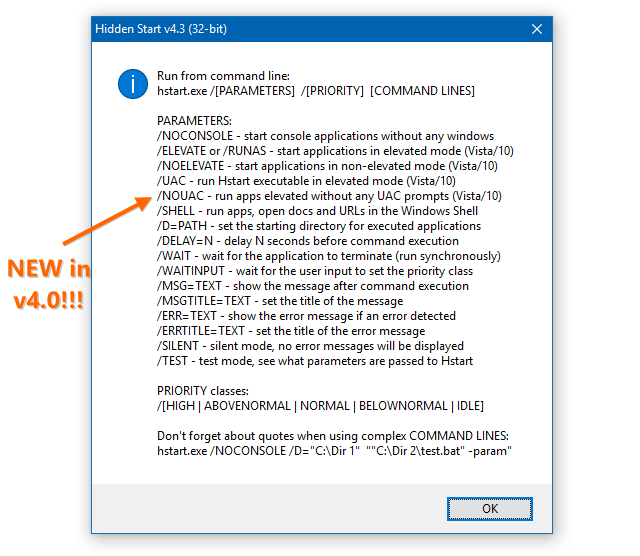 Hstart is a must have if you use batch files on an everyday basis for backups, various file sync and copy scripts, automatic source code compilation or code signing. Read the examples section below to see how it works out and how it can help you. The GUI tool makes it easy to create complex command lines and test them immediately. hstart /NOCONSOLE "batch_file_1.bat" "batch_file_2.bat" "batch_file_3.bat"
"cmd.exe /c "MyDailyBackup.bat > backup-log.txt""
The /IDLE command line switch means that the backup process will run with the lowest priority class, and /D="" sets the starting directory of the batch file (required if the command line or script contain relative paths). hstart.exe /NOUAC /NOCONSOLE "D:\Batch Files\Riquires_Admin_Rights.bat"
"cmd.exe /c "D:\test.bat > test-output.txt""
For more information, see tutorials and browse the "examples" folder.